Start by opening up a new document (600X500px). And fill your canvas with black. Now paste in a photo of a man looking distraught. Try to fit it into the right half of your image, and make sure that it is the same height as your canvas. Cut out the man from his original background using the lasso tool. Don’t worry if the outline on the hair isn’t quite perfect. Now duplicate your photo layer and set the duplicates opacity to 50%. Then change the layer’s blending mode to ‘hard light’. This should bring out the details of the image, and make it much bolder. Then merge this duplicate layer down with your original photo layer. Now use your lasso tool to cut out the man’s head (just cut directly across his hand). You want to follow the line of his jaw, and avoid his body completely. With your selection in place copy/paste this onto a new layer. Then return your you original photo and repeat the same steps with the man’s hand, taking care to only include the hand in your selection and not his face or body. Then copy/paste this onto a new top layer. It’s very important that the hand is the top layer out of all your layers, positioning it above the head cutout layer. Now select your original photo layer and apply a layer mask (reveal all). Then select a large black paintbrush, set to 0% hardness and 20% opacity. Then paint over the side of your man’s body, blending it subtly into your black background. The reason for using a layer mask for this step is that if you used an eraser brush it would be destructive to your image, and it would be much harder to undo what you’d done (whereas you can just remove the layer mask at any time). Now repeat the same steps on the ‘head’ and ‘hand layers’. However, because you’re basically erasing parts of these layers you’ll need to hide your original photo layer so that you can view the result of this erasing process, otherwise the image will just appear the same as the original photo will show through underneath your erasing, rather than your black background. The image below shows the erased head/hand layers. Be careful just to erase the bottom of the wrist and the finger on the hand that overlaps the background, and not your original photo. This is because if you erase too much of the hand you’ll get ugly looking lines showing through from the head layer beneath it. Now make your original photo layer visible again. This should hide your erasing that you’ve just done. However, you want your erasing to be seen, so you’ll need to delete parts of the original photo that are impacting on these areas. The images below show the area that I selected/erased using the lasso tool, and then how the image is looking so far. For these next few steps I’ll be using some cool Halloween brushes. You can find some great one’s in our Halloween roundup of 40+ of the best Halloween Photoshop Brush Sets. My personal favorite is this blood brush that I’ll be using. Now create a new layer above your ‘head’ layer and below your ‘hand layer’, called ‘skull brush’. 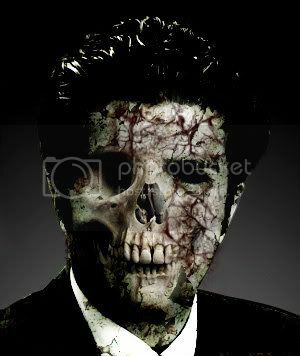 Download a skull brush set and use it to paint a skull outline over your man’s face. Then change the layer blend mode to ‘multiply’ and the layer opacity to 60%. Then use your lasso tool to delete all of the skull apart from the teeth, and a few extra lines to add spooky detail to your man’s face. Now download a blood splatter brush set, and create a new layer above your ‘skull brush’ layer called ‘blood head’. Apply many brush strokes using a variety of brushes to achieve a random splattered result. Be sure to use a darkish red, nothing too bright. Then reduce your layer opacity to 60% and set the layer blend mode to ‘color burn’. The images below show with ‘hand’ layer hidden, and then visible. The point of isolating the hand, head and body onto different layers is so that you can realistically apply blood to each part, as clearly there would not be a uniform marking of blood across hand/head/body, as this would flatten the image. I decide that my ‘skull brush’ layer is looking too intense, so I reduce it’s opacity to around 30%. Then I duplicate my ‘blood head’ layer. This should make the blood more intense. However, I only want the blood to be quite this intese in certain areas, so I use a soft eraser brush to brush away parts of the duplicate that should be fainter. This not only gives a more random bloodied effect, but should appear as if some parts of the blood is dried (being darker) whereas some is still wet. Now select your ‘hand’ layer. Select your magic wand tool, set to 10% tolerance, and then click somewhere around your hand. Then go to select>inverse to invert your selection so that just your hand is selected. Then with this selection in place create a new layer above your ‘hand’ layer called ‘hand blood’. Repeat the exact same steps as you did you apply blood to your head layer, including the duplicating of the original blood layer and erasing parts of the duplicate. The selection will mean that no part of your brush strokes will go outside the hand shape. Now the next step is to – you guessed it! – apply blood to the man’s body. Repeat the exact same techniques as before. As I mentioned earlier, the great thing about isolating the body/head/hand is that now in applying blood to the body, you won’t effect the man’s head, so it will look as if the head is forwards from the body, making the overall effect more realistic. The images below show the ‘head’ layer as invisible and then visible, after blood has been applied to the body. Now paste in a photo of a concrete wall under all of your photo layers and call the layer ‘background’. Then reduce your concrete photo layer’s opacity to 20%, and use a large, soft eraser brush (set to 25%) to erase away all of the photo apart from a small area, that acts as a distant background, dimly lit behind your man. Now create a new layer above your background layer called ‘hand print’. I downloaded a bloody hand print brush set, and then applied one of the brushes over the concrete wall area. I created 2 hand prints by duplicating the first and going to edit>transform>flip horizontal. On both layers I reduced the layer opacity to 30% for a more subtle effect. Then I selected my smudge tool (set to 50% strength, 10 size) and smudged down the bottoms of the hand prints, to give the impression that someone had been dragged down. Finally, I used my eraser brush to erase the edges of the hands slightly, and the bottoms of the blood trails in order to fit with the lighting on the concrete wall. As the blood gets further away from the center of the light source, clearly it must get darker. Finally to finish off the image I applied a few small details. I used the lasso tool to clean up some sloppy edges on the right side of my man. Then I darkened the man’s right eye to fit with the intense shadows on that side of his body. Finally, I selected my ‘blood head’ layers and applied some drip marks that are meant to look like they are coming from the blood on his fingers. I really hope that you enjoyed this tutorial, and would love to hear your thoughts on it. Thanks Twopo, I’m glad you enjoyed it! looks great nice work.. love this effect. Tutorials Room: Honestly? Your visitors must scare very easily. Wow, can’t wait to turn myself into a zombie! Chuck: Great point, I’ll definitely try a tutorial using that kind of effect in the future. Awesome result! Thanks for sharing. this is super duper brilliant… awesome!!! its not really a zombie. its really just blood. but, but still its good. the picture is not load correctly?? i can follow it….but,,thanks 4 tutorial. it would be scare. hehehe.